A 40 yo female brought to casualty, unconscious since 1 day, history of rapidly progressive dementia, abnormal cognition, was under psychiatric treatment. T2 hyper intensity with restricted diffusion involving caudate nuclei, putamen , dorso medial thalami. Involvement is bilateral and relatively symmetrical. Cerebral cortical T2 hyper intensity with restricted diffusion in bilateral fronto temporo parietal regions and cingulate gyri. MRI findings with rapidly progressive dementia clinically goes in favor of Creutzfeldt Jakob Disease. Syn: A transmissible Spongiform Encephalopathy. A fatal and potentially transmissible disorder caused by prion (a proteinaceous infectious particle devoid of DNA or RNA). Clinically characterized by Rapidly progressive dementia. nvCJD common in younger age group where as sCJD common in older age group, 7th decade. nvCJD limited to Europe where as sCJD occurs throughout world, in all races. CJD, a prion disease can be inherited, sporadic or acquired (infectious), 10-15% of human prion disease cases associated with dominant mutations in autosomal prion protein (PrPc) gene (PRNP) on chromosome 20. Variable pyramidal, extrapyramidal and cerebellar signs. More than 2 of following: Myoclonus, visual impairment, cerebellar signs, pyramidal or extrapyramidal signs, or akinetic mutism. Duration less than 2 years. 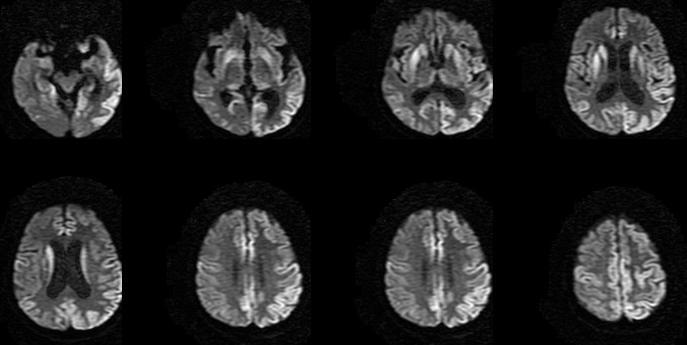 Imaging wise best diagnostic clue is T2 hyper intensity involving bilateral basal ganglia, thalami and cerebral cortex with an associated atrophy, both the findings are progressive on follow up imaging. Among basal ganglia, caudate and putamenal involvement is more common than Globus pallidi. In cerebral cortex frontal and temporal lobes are commonly involved. Prominently involves cortical gray matter. White matter is spared. CT is often normal. May show only cerebral cortical atrophy with dilatation of lateral ventricles. Atrophy will be progressive on follow up imaging. MRI is investigation of choice. Hyper intensity with restricted diffusion involving deep grey nuclei and cerebral cortical gray matter. Diffusion hyper intensity may subside later in disease. An associated atrophy. Contrast enhanced MRI going to non contributory. 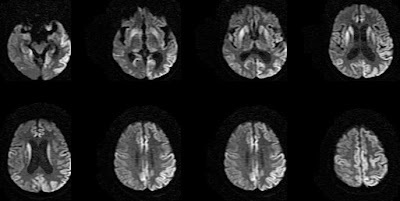 T1 Hyperintensity in the region of globus pallidi is rare but reported in cases of sporadic CJD. 1. Pulvinar sign: Due to involvement of pulvinar nuclei (posterior portion) of thalami, bilateral symmetrical T2 hyper intensity. 2. Hockey stick sign: bilateral symmetrical T2 hyper intensity involving Pulvinar and dorso medial thalamic nuclei. Other causes of dementia with an associated atrophy like Alzheimer dementia, Frontotemporal dementia. HIV Encephalopathy and AIDS dementia complex. Leigh disease but primarily a childhood disease. Definitive diagnosis of prion disease requires brain biopsy. CJD has long incubation period, but rapidly progressive once clinical symptoms begin. Rapidly progressing dementia with death usually ensuing within months of onset. Mean duration of sCJD is 8 months. nvC]D has longer course mean duration of 16 months.